Medscape is the leading online global destination for physicians and healthcare professionals worldwide, offering the latest medical news and expert perspectives; essential point of care drug and disease information; and relevant professional care and Continuing Medical Education. obesity which included Professor Robert Lustig, the Chair of the National Obesity Forum, Professor David Haslam the vice president of the Faculty of Public Health, Professor Simon Capewell and Cardiovascular research scientist Dr James Di-Nicolantonio. In addition to being reported in the Daily Mirror, The Express and The Huffington Post I was interviewed about it on Sky News. 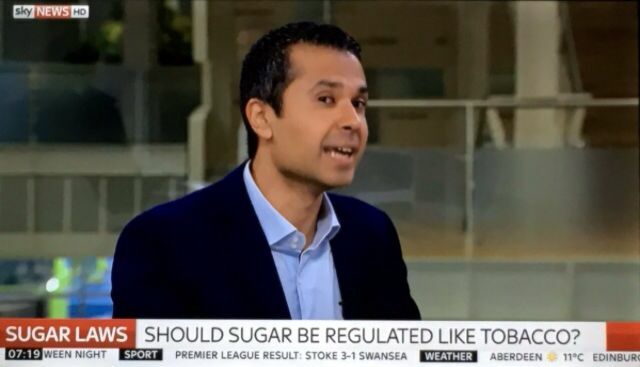 Here’s the Sky News interview and the full article including a clip from my parliamentary speech at the Sugar Summit from a few weeks ago. An econometric analysis of 175 countries (considered the highest quality of study with the exception of randomized controlled trials) revealed that for every additional 150 sugar calories available for consumption, there was an 11-fold increase in the prevalence of type 2 diabetes in the population. This is compared with 150 calories from another source such as fat or protein and independent of body mass index (BMI) and physical activity levels. The prevalence of type 2 diabetes in the US population between 1988 and 2012 increased by 25% in both obese and normal-weight populations, which goes to show that type 2 diabetes is not a condition related purely to obesity. A high-quality prospective cohort study revealed a trebling in cardiovascular mortality among US adults who consumed more than 25% of calories from added sugar versus those who consumed less than 10%, with consistent findings across physical activity levels and BMI. The positive health effects of reducing sugar intake appear to be quite rapid. In a study of 43 Latino and African-American children with metabolic syndrome, keeping total calories and calories from carbohydrate identical, a reduction from a mean of 28% of calories from added sugar to 10% significantly reduced triglycerides, LDL cholesterol, blood pressure, and fasting insulin within just 10 days. How much sugar is safe? The consumption of just small amounts of free sugar, which includes all added sugar and sugar present in fruit juice, syrups and honey, on a daily basis, has a deleterious impact on the most common noncommunicable disease globally: tooth decay. Treatment of dental disease is responsible for 5%-10% of health expenditures in industrialized countries, and in the UK, tooth decay is the number-one cause of chronic pain and hospital admission in young children. As pointed out by researchers from the London School of Hygiene & Tropical Medicine, there is a powerful argument that the WHO should recommend a maximum limit of sugar consumption to make up no more than 3% of daily calories (about three teaspoons). The average UK and US citizen, however, consumes at least four to seven times that amount. This is perhaps not surprising when one acknowledges that it has been almost impossible for the consumer to avoid sugar, as it is so prevalent in the food environment and much of it is hidden. In the United States, almost half of all sugar consumption comes from foods one wouldn’t normally associate as having added sugar, such as ketchup, salad dressings, and bread. A third of sugar consumption comes from sugary drinks, and a sixth from foods that people normally perceive as junk, such as chocolates, cookies, and ice cream.